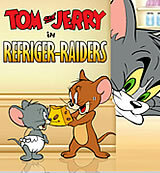 Description: You have two options in this Tom and Jerry Game. You can choose to be Tom or Jerry. If you choose Tom, move him by using Arrow Keys and press Space Bar to throw water balloons at Jerry and Nibbles. You can only miss five times and then you're done. Game over. If you choose Jerry you also use Arrow keys to move him. Pick up and drop food to a hungry Nibbles with Space Bar. The higher the drop, the more points you'll earn. Be careful, if Tom hits you three times, it's game over. Enjoy! !